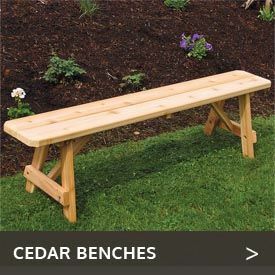 If you love the gentle motion and ultimate relaxation only a glider can give, you will love the premium collection of Western red cedar wood outdoor gliders and sets available at Cedarwood Furniture. Here you can pick from a host of top-notch gliders to suit any style or space. We have plain cedar gliders that are simply elegant as well as delicately carved gliders that will evoke plenty of compliments from your guests. Our gliders can seat anywhere from one to four persons, letting you tailor your outdoor furniture ensemble to accommodate the numbers you need to seat. But a word of caution: to prevent discord, order as many of these super-comfortable seats as you can, because everyone in your family, as well as friends and visitors, will want to sit in one. 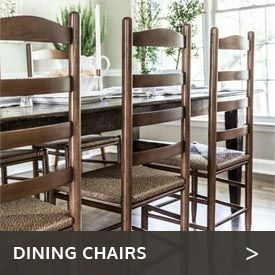 Check out our cedar glider collections and sets, which will give you matching gliders and tables, for an unbeatably relaxing, instant outdoor ensemble. 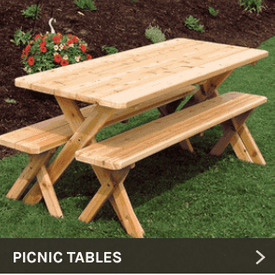 Made in Canada or the U.S., many of these gliders are built of premium Western red cedar. We also have gliders made of Northern white cedar, which, like its red cousin, is noted for standing up to weather and insects. Those on a budget might consider our economical and lightweight pine gliders that look particularly lovely when painted. Most of our gliders are available unfinished or in a variety of beautiful colors and finishes.